Yellow poplar or tulip poplar is the tallest hardwood tree in North America with one of the most perfect and straight trunks in the forest. Yellow poplar has a unique leaf with four lobes separated by rounded notches. The showy flower is tulip-like (or lily-like) which supports the alternate name of tulip poplar. The soft and light wood was hollowed out by early American settlers to use as canoes. Today's wood is used for furniture and pallets. The tulip poplar grows 80 to 100 feet tall and trunks become massive in old age, becoming deeply furrowed with thick bark. The tree maintains a straight trunk and generally does not form double or multiple leaders. Tuliptree has a moderate to rapid (on good sites) growth rate at first but slows down with age. The softwood reportedly is subject to storm damage but the trees held up remarkably well in the South during hurricane 'Hugo.' It is probably stronger than given credit for. The largest trees in the east are in the Joyce Kilmer Forest in North Carolina, some reaching more than 150 feet with seven-foot diameter trunks. The fall color is gold to yellow being more pronounced in the northern part of its range. The scented, tulip-like, greenish-yellow flowers appear in mid-spring but are not as ornamental as those of other flowering trees because they are far from view. 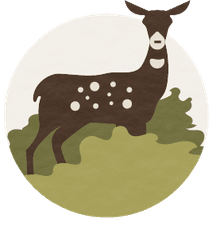 Habitat: Deep, rich, well-drained soils of forest coves and lower mountain slopes. Description: One of the most attractive and tallest of eastern hardwoods. It is fast growing and may reach 300 years of age on deep, rich, well-drained soils of forest coves and lower mountain slopes. Distribution map of Liriodendron tulipifera. 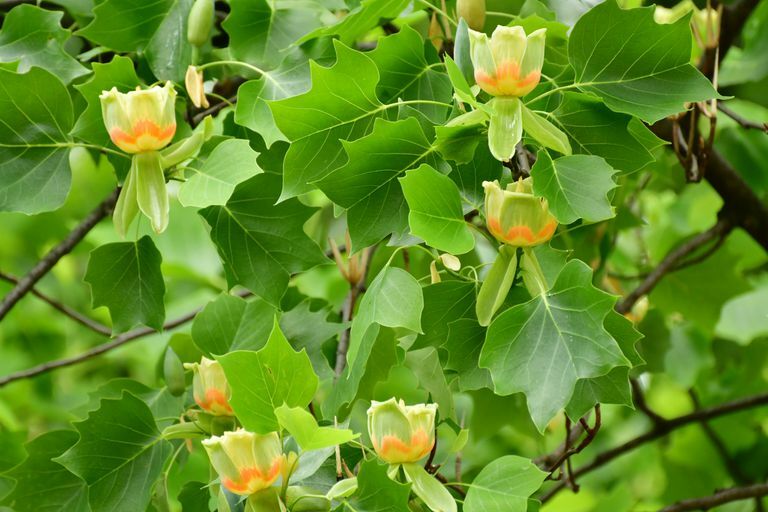 "Although a rather large tree, Tulip-Poplar could be used along residential streets with very large lots and plenty of soil for root growth if set back 10 or 15 feet. Not generally planted in large numbers and probably best for a specimen or for lining commercial entrances with lots of soil space. Trees can be planted from containers at any time in the south but transplanting from a field nursery should be done in spring, followed by faithful watering. Plants prefer well-drained, acid soil. Drought conditions in summer can cause premature defoliation of interior leaves which turn bright yellow and fall to the ground, especially on newly-transplanted trees. The tree may be short-lived in parts of USDA hardiness zone 9, although there are a number of young specimens about two feet in diameter in the southern part of USDA hardiness zone 8b. It is usually recommended only for moist sites in many parts of Texas, including Dallas, but has grown in an open area with plenty of soil space for root expansion near Auburn and Charlotte without irrigation where the trees are vigorous and look nice." Larval mine of yellow-poplar weevil. Insects: "Aphids, particularly Tuliptree aphid, can build up to large numbers, leaving heavy deposits of honeydew on lower leaves, cars, and other hard surfaces below. Black, sooty mold may grow on the honeydew. Although this does little permanent damage to the tree, the honeydew, and sooty mold can be annoying. Tuliptree scales are brown, oval and may be first seen on lower branches. Scales deposit honeydew which supports the growth of sooty mold. Use horticultural oil sprays in spring before plant growth begins. Tuliptree is considered resistant to gypsy moth." Diseases: "Tuliptree is attacked by several cankers. Infected, girdled branches dieback from the tip to the point of infection. Keep trees healthy and prune out infected branches. Leaf spots are usually not serious enough to warrant chemical controls. Once leaves are heavily infected, the opportunity for chemical control is lost. Rake up and dispose of infected leaves. Leaves often fall during summer and litter the ground with yellow, spotted leaves. Powdery mildew causes a white coating on the leaves and is not usually harmful.